It looked and sounded like business as usual a few days ago at Drakes Bay Oyster Company on Drakes Estero on the Point Reyes Peninsula. Seventy or more people were crowded around the oyster farm’s eight picnic tables, shucking oysters and barbecuing them on portable grills, containers of butter and garlic, pesto sauce and mignonette close at hand. Carriere and his group of Marin Rotarians were eating their way through 10 dozen oysters partly to show their support for Drakes Bay. The National Park Service ordered Lunny to close its retail and canning operations by the end of day Thursday. Wholesale operations can continue for a few more months, but the time is clearly running out after years of unsuccessful court battles. Lunny’s lease with the Park Service expired in 2012. The day after Carriere's visit, it was clear that Drakes Bay was shutting down. Workers were stacking mesh oyster grow bags in big piles. Drakes Bay owner Kevin Lunny says the workers would normally have been filling the bags with baby oysters, then mooring them to sand bars in the bay. “It’s so hard to be at the farm now. We watch all these people working themselves out of a job,” he said. Lunny is trucking his equipment to a friend's ranch in Petaluma for storage. The shutdown has begun because Lunny is almost out of legal options. In 2012, then-Secretary of the Interior Ken Salazar refused to renew Lunny’s lease, and earlier this year, the U.S. Supreme Court refused to hear an appeal of a lower court’s decision upholding Salazar’s ruling. That frees the Park Service to carry out the mandate of Congress in 1976, when it declared Drakes Estero “potential wilderness.” Drake’s Estero will join the neighboring and much smaller Limantour Estero as the only American wilderness bays on the West Coast. 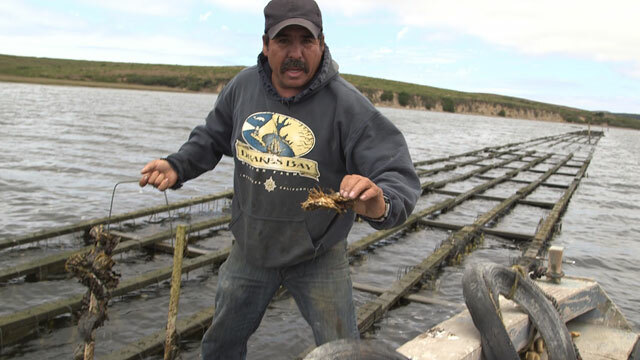 Lunny and his family bought the oyster farm in 2004 from the Johnsons, another old Point Reyes family. You can see the Lunny’s dairy and cattle ranch on a ridge above the Estero. He’s a third generation Point Reyes rancher. So he’ll have a home and a job to return to when the oyster farm closes. His 25 workers aren’t so fortunate. 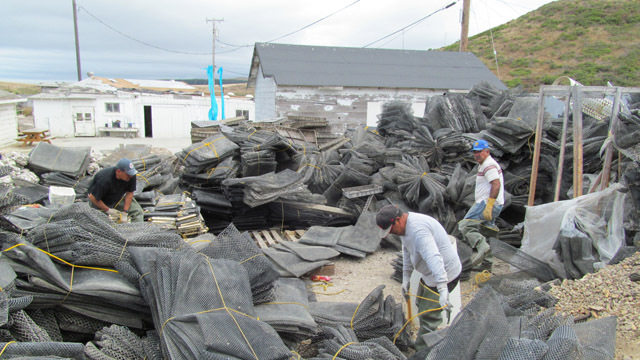 “Well it’s very difficult,” said Paco Aceves, who has worked at Drakes Bay for four years. He manages the retail shack, and lives in a set of cottages at the farm with his wife, three kids and a few other employees. An attorney for Marin Legal Aid is negotiating on behalf of Aceves and other workers for up to $20,000 in federal aid for housing and job retraining. Kevin Lunny says he still hopes, somehow, to keep the farm going, and as he showed me around a few days ago, he seemed in a funny state of mind, somewhere between denial, defiance and resignation. Earlier this month, the Park Service ordered Lunny to remove his “personal property,” the grow bags, the settling trays used to propagate larval oysters, the old shipping container converted into a canning facility, the non-native Pacific oysters that Lunny grows in the Estero and the five miles of creosote-covered oyster racks set decades ago into the muddy floor of the estero. But Lunny is contesting what he’s responsible for. For instance, he said he’ll clean up the plastic debris on the estero floor under the racks. That’s mostly old equipment that’s sunk to the bottom. But Lunny said the racks themselves don’t belong to him. Lunny argues that the racks and his retail shack, and the cottages where his workers live, are just like the barns and corrals and other buildings belonging to the historic ranches in Point Reyes National Seashore. The Park Service owns all that property, and leases it back to the ranching families. 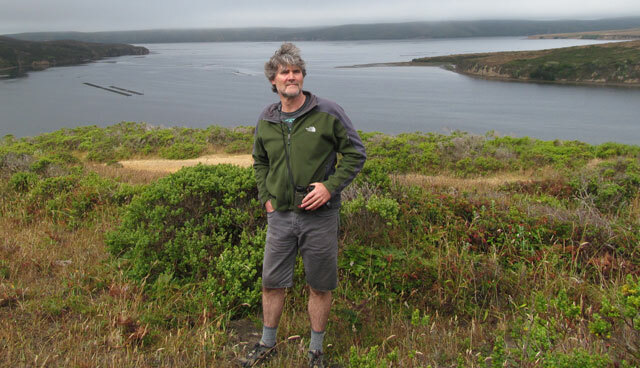 Point Reyes National Seashore spokesman John Dell’Osso said in an email he couldn’t say exactly what the Park Service expects from Lunny, or what its plans are to fulfill the mandate from Congress to make Drake’s Estero a wilderness. “It’s too early for us to comment on anything related to the oyster company,” Dell’Osso wrote, because of ongoing lawsuits from Lunny and his allies. Two biologists I talked to suggested that the Park Service should take a very patient approach. “Because we don’t know what things were like before the oyster company came in originally," says Katharyn Boyer, a marine biologist at San Francisco State’s Romberg Tiburon Center for Environmental Studies. Boyer has avoided the bitter scientific debates between environmental activists and local food advocates over whether the oyster farm is good or bad for the estero. Ironically, she’s used tons of oyster shells from Lunny for her own work restoring native Olympia oysters to San Francisco Bay. And she says ending the oyster company’s thousands of motorboat trips a year “will be good for harbor seals,” which raise their pups on sandbars in the bay. The motorboats sometimes cut up the estero’s large fields of eel grass, but Boyer says the eel grass beds heal quickly with little intervention. Removing the racks would also provide more growing area for eel grass, which acts a nursery for fish and other sea life. Another biologist says nature may not need much help. On a ridge in a wet fog, marine biologist Jon Mueller, a professor at College of Marin, points out a northern harrier, a hawk that hunts, he says, like an owl. We're here to get a view of Home and Schooner Bays, two of the estero’s northern fingers. We can see a hundred yards of oyster racks, plus a flock of nesting egrets and some white pelicans. I asked Mueller for his ideas about turning the estero into wilderness. “Well I don’t think anyone really knows the answer to that question,” he said. But Mueller joins Boyer in recommending a thorough study, an inventory of the estero’s natural resources after the oyster farm shuts down -- from eelgrass to egrets, herons and the black brant that winter here, to bat rays and fish and the harbor seals that raise their pups here.